A portable laparoscopic technique trainer for structured and staged 'hands-on' training. 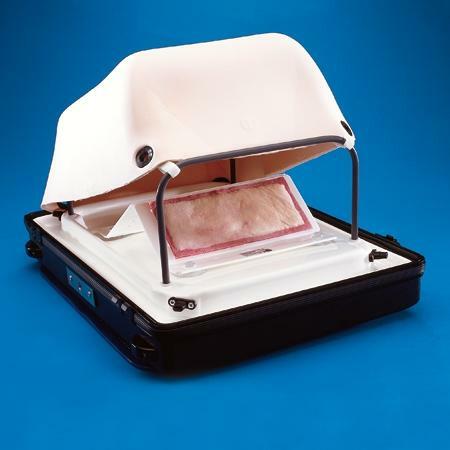 The carrying case unfolds to provide an integral work surface and tray in the base and storage compartment in the lid. The base unit, onto which the Soft Tissue Retaining Set can be placed for the presentation of soft tissue components, can be used for open surgical practice, or with the frame and abdominal wall in place, for laparoscopic technique training. A wide range of Limbs & Things synthetic soft tissue components can be introduced to teach techniques in line with the trainees clinical progression, and their chosen specialty. The Trainer is supplied with the Small Surgical Dissection Pad which allows seven core laparoscopic techniques to be practiced.